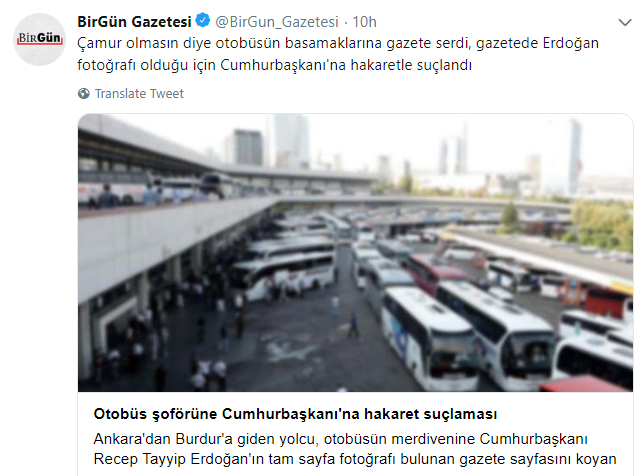 An Ankara bus driver has been detained by Turkish police for covering bus stairs with newspaper bearing photos of President Erdogan, the Birgun daily reported. According to the report, acting on a tip-off by a passanger on a bus en route from Ankara to Afyonkarahisar province, the police detained the driver, R.K., for insulting President Erdogan by covering bus stairs with newspaper bearing his photos. Insulting the president is a crime in Turkey, according to the controversial Article 299 of the Turkish Penal Code (TCK). Whoever insults the president can face up to four years in prison, a sentence that can be increased if the crime was committed through the mass media. According to the Denge ve Denetleme Ağı, or DDA (Checks and Balances Network), an umbrella civil society group that consists of 271 nongovernmental organizations, 13,000 cases have been filed against individuals over the past seven years based on Article 299. The group said elected individuals should be more tolerant of criticism, satire and accusations, which are a natural result of being in those posts. The slightest criticism of Erdoğan is considered an insult, and there has been a rise in the number of cases in Turkey in which people inform on others claiming that they insulted the president, the government or government officials.